I recognize that every human is free. Free to their own choice. Free to their own perception. Free to their own expression of that perception and choice. I recognize that perception is limited and any interpretation of perception can be described as a story of what happened. Each who perceives will tell a different story in their attempt to share their perception. I recognize that your perception will almost certainly be different than mine. I perceived the symbol captured here occurring much larger, much more vivid, and much more active in the wind this evening than these small photo representations will ever portray (sort of like my words – limited in conveying experience). I invite you to zoom into the photos to give yourself a sense of the bombast of it, blazing before you. 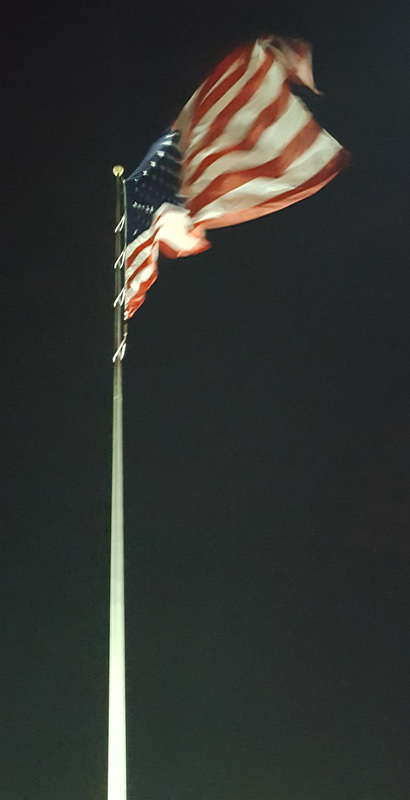 If that doesn’t work, go to any Perkins at night, with the wind blowing in off Lake Erie and experience it for yourself – man, they fly a glorious Old Glory. Sorrow was what I experienced for those who don’t stand before this symbol and experience anything other than the awe that I felt, standing below and before it waving wildly in the wind. Shall I give up my experience in favor of yours? Shall I attempt to empathize with your plight? The plight of your creation, your perception, and your choice of story to tell? Shall I listen and experience you? Kneel with you? Risk losing my Old Glory to understand yours? Stand next to you and look down, ashamed for myself of what it means to you? Or shall I stand? Clear about who I am and who you are? Standing for who we were born to be – free and mighty and in love. As I stood before it I was immediately taken in, quickly distracted (enacted) into being with it. This symbol; this story; I was compelled to capture it. To tell you that in it I saw the future – yours and mine – unlimited by our limited perception of space and time. In it I saw Truth, Beauty, Freedom and above all things Love. via Dialetheia* by Anil Menon.